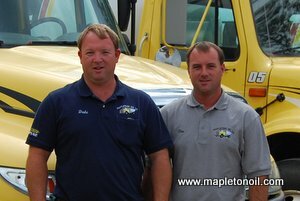 Mapleton Oil Company got its start in November 2003 with one oil truck. We had worked in the family-owned earth moving business, doing construction jobs spring, summer and fall and plowing snow in the winter. As our snow plowing business kept getting less and less the idea of delivering heating fuel oil in during the winter to keep ourselves busy was a logical choice. Our early customers were family and friends but word of mouth was spreading. We had a great winter delivering but soon came summer and it was back to construction. We were very busy in the summer of 2004 working days at construction and delivering to our ever-growing fuel customers after supper. Late 2004 we bought another delivery truck and incorporated in January 2005. With just two of us delivering, life that year was very hectic. We also added a new product, off road diesel fuel, to see to the logging industry. With new customers being added all the time, a third truck was added in 2006 and we hired a part-time employee. We were still working construction jobs in the summer but by 2007 our main focus was on our oil delivery business. That year we installed a tank farm and bought a semi and tanker to start hauling and storing our own fuel from the depots. Up until 2007 we had been buying our products from a local oil business. A fourth delivery truck was added and during that winter we had four full-time employees. 2008 through 2010 was challenging for us due to such volatility in the oil market. 2008 saw crude oil at an all-time high of $147 per barrel but we weathered the storm. 2010 was a bittersweet year for us. We were excited to add propane to our fuel line-up that year but sad as the decision was made to stop doing construction work. Now whether it is heating fuel, kerosene, off and on road diesel, propane, or propane service, our main focus is providing our customers with quality fuels and exceptional service. Mapleton Oil Company will never let you get cold.